Check out the official 'Motor City Comic Con' website today! Ladies and Gentlemen, it is our privilege to introduce to you an aspiring, and therein inspiring new Exclusive Magazine writer/photographer, Lauren Galasso. Lauren covered this years Motor City Comic Con 2014 for Exclusive Magazine. 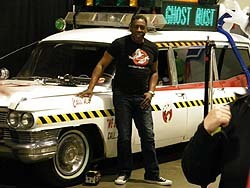 This past weekend at the Suburban Collection Showplace in Novi, I went to Motor City Comic-Con. It was an experience I won’t soon forget. I had the pleasure of meeting celebrities like Robert Hays, William Shatner and Kristanna Loken. I also interviewed a few fans with very interesting costumes. There were also artists who came to sell their paintings and drawings to try and make a living. All in all it was a very entertaining weekend. I’ve never been Comic-Con before so I had to do some digging. I stopped to talk to some people who told me it’s pretty much the same deal every year. The same vendors and artists come and try and sell their wares and collections, but weren’t as lucky as others who sold novelty items. The celebrity roster this year was on fire with more recognizable faces too, but surprisingly many did not get too much attention either. Unless of course they were William Shatner and John Barrowman! After talking to an onslaught of celebrities I learnt that some were their for the fans and others only showed up for the cash. 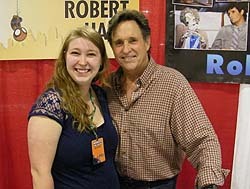 One celebrity, Robert Hays, had me in stitches. He’s most famous for his starring role in the movie 'Airplane!' I was pretty upset that more people did not want to meet this man. He told me funny stories about other celebrities and how busy his life has been and everything. He’s just an all around nice guy who really seems to enjoy what he does. I was excited to meet William Shatner like the rest of the world, but $80 for an autograph or even $90 for a picture? I realized he wasn’t that important! That didn’t stop everyone else who stood in line for a good three hours before he was scheduled to show up though. After waiting in line for around two hours with Russell [Director & Editor in Chief, Exclusive Magazine] so he could get an autograph, I was a little disappointed. It was like an assembly line. You handed him the picture, he signed it and you were on your way. I managed to get a 20 minute interview with Martin Kove and William Zabka who are most recognized for their roles in 'The Karate Kid.' A pretty hot question that was brought up was “Who would win in a fight between the two of you today?” Martin graciously said he’d let Billy win! Whilst Billy flat out said he would win and Martin knew it! Another celebrity that I had the pleasure of meeting was Kristanna Loken. Imagining her as the T-X from 'Terminator 3,' you’d think she was this tough ruthless chick, but she’s as nice as she is beautiful. Clocking in at 6 feet I felt like a child next to her, but it was well worth it. One celebrity that I did not get to meet was Carl Urban because he was also pretty pricey with his autographs. There were also a few stars from AMC’s 'The Walking Dead.' Kyla Kenedy, Scott Wilson, Jon Bernthal and even Jane McNeill. I interviewed Kyla who said she was very excited to meet her fans, her school life, and how much she loved penguins! There were plenty of fans walking around dressed as popular characters from movies, video games and comics. This is where the fun began. There were a LOT of 'Star Wars' costumes. 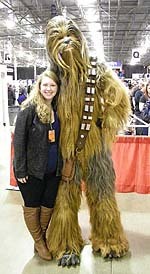 I even took a picture with Chewbacca! There was someone dressed as a giant Boba Fett lego character. There were also some 'Ghostbusters' fans and some Trekkies and a girl who had an all-balloon hand-made 'Teenage Muntant Ninja Turtle' costume! I got to talk to Emmy from Sterling Heights MI who dressed as Sue Storm from the 'Fantastic Four.' I asked her why she put so much time and effort into her costume. She told me about her love for the Invisible Woman and how she enjoys the attention of being a super hero. I met a creative guy named John Quick from Sports Creek who was dressed as his own interpretation of an Arctic Hunter Predator. The costume itself was really impressive. He worked very hard on it and explained his favorite part was the actual working shoulder canon which I thought was pretty cool. I asked him why he did these shows and he said “because the fans love it." Another amazing work of art was a from a guy named Ryan Savage from Chesterfield who created a costume combination of Iron Man and Boba Fett. He called it Iron-Fett. He and his friend mostly worked on it together. I thought the working lights were impressive. He explained how his friend went “over the top” with the creation of the helmet which led me to appreciate the time and effort people invest in these costumes and lifestyles. While waiting in line to meet William Shatner, I met a guy named Jason Walker. 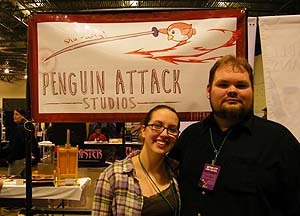 He told me about the business he and his wife Tiffany had called Penguin Attack Studios. I sat down to interview them and they told me all about their business which include mini commissions at conventions. They have been to six already this year. Their mini commissions were drawings of people and full illustrations and customer requests. Some other things they had for sale were original art and stickers that they make themselves. According to them business is pretty good and the best convention this year for them was Midwest Media Expo which dealt with Anime mostly. By the end of the day my feet were killing me. It is impossible to experience and take everything in all at once. You really have to sit back and enjoy the atmosphere of it all and appreciate the passion that these people have for this kind of thing. It’s not just a hobby, but a way of life to some. If you ever have a chance to go to a convention like this, I strongly urge you to do so because it’s a lot of fun. There’s lots of great people and very talented artists. Whether it be the costumes on display, you want to buy a collectible toy or comic book, or you simply just want to walk around and see everything and everybody, this is the place to be. 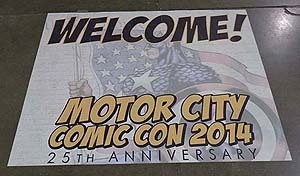 Motor City Comic Con is a must-have experience for everyong in love with the movie industry; young or old!